Yes, I will echo that, thak you for a fantastic day yesterday. I enjoyed myself immensely and the ride up into the Peak District was wonderful - we do have some fantastic roads around us (it's just a shame that it's all being messed about with!!!). I will admit to being a bit shaken when you said "no, we'll do the RoSPA test now!" as I thought it would be towards the end of the day - however, I understand the process behind doing it there and then, first thing. 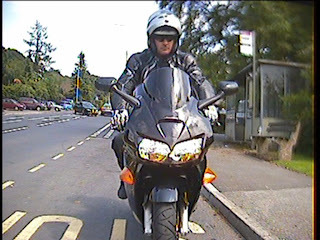 You get to assess the rider from the outset (in this case little old me!) and you get what you get - not someone who is trying to impress or deliver what you've taught them during the day. It's this test that to my mind, means you know where you stand and what you need to work on during the day. I was chuffed to bits to have been awarded to my RoSPA Gold award from you and was so pleased that you were impressed with me from the outset. As I said to you, being on the road (bike or car) means something to me and due to the job I do for a living what you do on the roads is I think, I direct reflection to you as a person. Your ability to assess, process and deal with information as it comes at you at what ever speed and if you can deal with it in a constant methodicaly manner, your riding is directly reflected in your position and cinfidence on the road. I wanted to do the test, not needed to do the test. 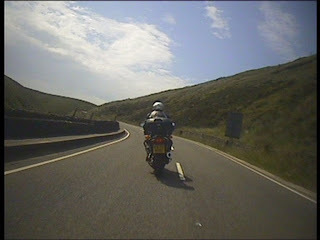 What it has reinforced for me, is that I am doing something right when I'm riding my bike around the UK. I hope that other riders get as much from their time with you as I did as I beieve your courses are perfect for those of us out there that want to enjoy their bikes, be it as a leisure exercise or as a an exercise directly related to your daily commute or job. I believe I've developed further and judging by the radio silence on the way back down the wonderful Snake Pass, I took that the be a good sign!!!! !